What Thai Buddhist temple was featured in the CBS reality show Amazing Race 9? | Cafe Arjun - 15 times WordPress Top Blog! 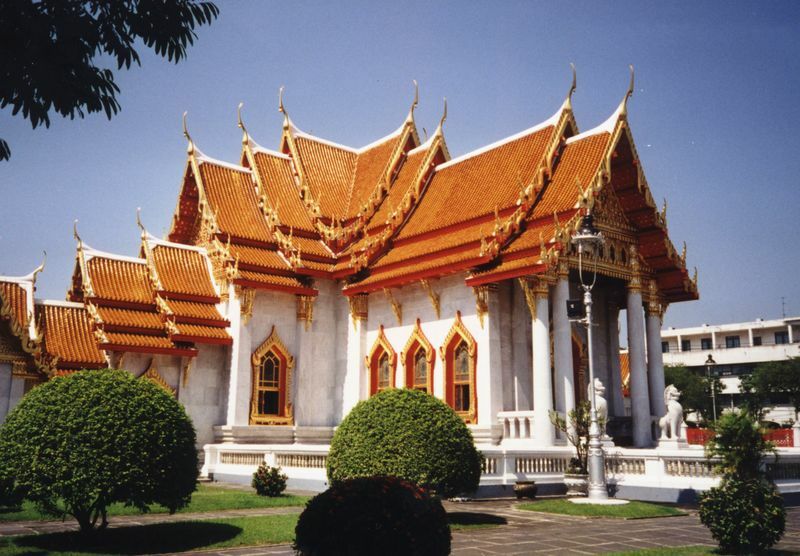 What Thai Buddhist temple was featured in the CBS reality show Amazing Race 9? Welcome back contestants. Marriott World of Rewards have given me a whole new reason to blog – Looking up answers and related information, but only when the answers are hard to find. It is one of the most beautiful temples in Bangkok (Capital city of Thailand) and was constructed by the 5th king in 1899. What does Wat Benchamabophit Dusitvanaram mean? Wat means a religious school or temple and Benchamabophit Dusitvanaram means fifth King. Thus – Temple of the 5th King. Made of Italian marble, with a built in Museum and shrines of the King and his wife, Marble temple is also one of the most popular attractions in Bangkok Thailand. Amazing race 9 featured this temple in 2006 as the 10th elimination. Buddha reincarnation Ram Bahadur Bamjan – 18 year old miracle boy! Tags : Amazing race 9 thai buddhist temple, bangkok, buddhism, Marble temple, marble temple buddhist bangkok thailand, temple, thailand, What Thai Buddhist temple was featured in the CBS reality show Amazing Race 9? ← India conquers the Moon. Indian Moon Impact Probe creates history! Thank you for setting-up such a nice blog, and thanks for your help in the Marriott contest. Keep up the good work! You are helping a lot of people and it is truly a good reason to maintain your blog. Hi, your blog is very nice – and helpful too. I learned a bit more about Thailand today. Thank you! Your help is amazing!! I was wondering why the answers recently seemed to be worded the same!! Thank you! Here is your answer for the Marriott question of the day. The most well known attraction on St. Kitts is Brimstone Hill Fortress National Park. Designated a World Heritage site by UNESCO in October 2000. Built over a period of 104 years beginning in 1690, British authorities consider the fortress to be one of the finest examples of British military architecture in the world. I got up early and did a bit of research. It was fun. Now I need to go back to my studies. I have a big test on Monday.